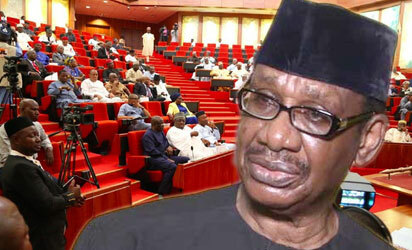 The Senate has urged President Muhammadu Buhari to rein in the chairman of the Presidential Action Committee on Anti-Corruption (PACAC), Professor Itse Sagay, who it accused of spreading falsehood and making hate speeches against the National Assembly. In a statement by its spokesman, Senator Aliyu Sabi Abdullahi, the Senate stated that Sagay was fond of using every opportunity he has to make public speeches to disparage the Federal Legislature by using uncouth and unprintable words to describe the legislators and the institution they represent. He noted that Sagay had been one of the few divisive elements in the Buhari administration who believe their relevance is enhanced only when they create constant tension between the legislature and the executive while also setting members of the executives against each other. Abdullahi noted that while the legislators had ignored past statements made by the Professor of law, his recent speech at a public lecture in Lagos organized by the Society of International Law where he gave false details about the salary and allowances of the legislators and the various bills passed bordered on inciting members of the public against the legislators and deliberately circulating hate speech; which the government is working hard to contain. “Ordinarily, we would ignore Sagay whose statements and attitude present him like a rascal and sadist instead of a former university teacher. However, his last speech in Lagos during which he was reeling out false and exaggerated figures about the salaries and allowances of legislators and also lied about the passage of anti-corruption bills showed that he just deliberately set out to undermine the legislative institution and lower its reputation in the estimation of right thinking members of the society and we therefore believe we should put him in his rightful place. “As an academic whose creed should be to find facts and make comments based on truth, we believe that Sagay should stop spreading beer parlour rumours about the salaries and allowances of legislators when he could simply get the facts from the Revenue Mobilization and Fiscal Allocation Commission (RMFAC) which is the body constitutionally charged with the responsibility of fixing salaries and allowances of all public officials. “Let us make it clear that our salaries and allowances are open books and the details can be taken from the RMFAC by any interested party. “Prof. Sagay at his lecture in Lagos also made comparisons which did little credit to his background as a lecturer as he was talking of the salary of the United States President and that of a Nigerian legislator. That is like comparing oranges with apples. Only a senile, jaded, rustic and outdated Professor of Law like Sagay will make such a comparison which falls flat on its face, even to an ordinary lay man. Surely, Sagay is basing his analysis on street talks. “Sagay could not even check the records before proclaiming that ‘the National Assembly has not passed a single bill for the promotion of anti-corruption war since it commenced business in July 2015′. First, the 8th National Assembly was inaugurated on June 9, 2015 not July. Also, it is on record that the Senate has passed the Whistle Blowers’ Protection Bill, Witness Protection Bill, Mutual Legal Assistance in Criminal Matters Bill and the Nigerian Financial Intelligence Agency Bill. “This man talks like a man who is constantly under the influence of some substance and perhaps possessed as he employs the language of a tout with no civility. He is probably constantly excited and incensed by the fact of having his first opportunity to find himself in the corridors of power. “He pontificates and talks as if the war against corruption of the Buhari administration depends solely on him to survive. He once publicly attacked the Attorney General of the Federation and accused him of not doing enough to prosecute the war. In the Lagos speech, he took a blanket swipe at the judiciary and rubbished that entire institution which he as a lawyer has the professional, ethical and constitutional duty to respect. “This is a man who cannot stand for Councilorship election and win. We challenge him to state what his contributions are in the election of our amiable President, Muhammadu Buhari and what new ideas he has contributed to making the fight against corruption more effective since his appointment. With an easily excited man like him as head of an advisory body, the nation has continued to lose anti-corruption cases in courts due to the failure of his advice. He needs to do more work and talk less because media prosecution cannot win the war on corruption”, Abdullahi stated. The Senate therefore called on the President to caution Sagay and stop him from further creating needless tension in the relationship between the executive and the legislature.